The floor scratch was corrected with WearMax Scratch Concealer - product is very good. 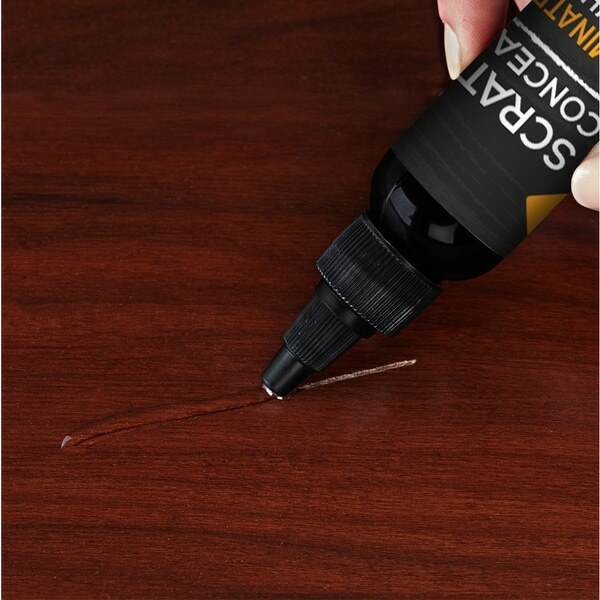 An easy to apply method to conceal the white marks left behind by scuffs or abrasions to hardwood flooring. WearMax Scratch Concealer is dried under direct light, creating a permanent seal that won't wash off when the floor is cleaned.When scratches appear on hardwood flooring the result is immediate anxiety. Nobody wants to see their flooring scratched, but truthfully scratches are inevitable. Today prefinished floors are mostly finished with aluminum oxide finishes. When that type of finish in particular gets a scratch it shows a white line. WearMax has perfected the formula to eliminate the white.Scratch Concealer is an easy to apply method for anyone to eliminate the white marks left behind by scratches, scuffs or abrasions to hardwood flooring. Scratch Concealer is dried under direct interior lighting and creates a permanent seal that will not wash off when the floor is cleaned. The technology in Scratch is unprecedented and patent pending. Patent Pending Formula - Really Works. Love this stuff. It does work really well to help hide scratches. It isn't a miracle by any means, but it does help "get the white out" which is important. very effective. works like a charm. Simply trying to locate a product that will remove the stupidity of someone extremely heavy sitting in a chair and sliding across the floor (stupid)! Hope this works! 5 Reasons to Install Bamboo Flooring from Overstock.com. Our guides provide customers with information about bamboo flooring. Best Budget-friendly Kitchen Flooring Options from Overstock.com. Our guides provide customers with information about the best budget-friendly kitchen flooring options.